Earl Bamber Motorsport and Team Carrera Cup Asia, with support from Porsche Motorsport Asia Pacific, are both aiming for class and overall victories on the Mountain this weekend for the 2019 Bathurst 12 Hour (31 January – 3 February). The Australian blue-riband event also acts as the first round of this year’s Intercontinental GT Challenge, in which Porsche is set to have a presence at all five races from around the world. 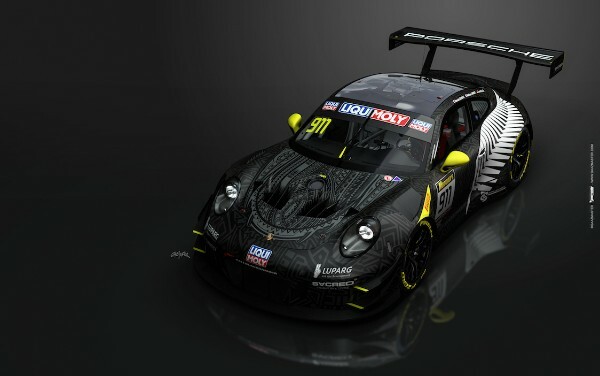 Announced at the Porsche Experience Centre in Shanghai earlier this month, New Zealand outfit Earl Bamber Motorsport will run a pair of Māori-inspired Porsche 911 GT3 R on its Bathurst 12 Hour debut. Earl Bamber will not be on driving duty and instead is expanding his team manager role into GT3 racing, following his first foray into the position in the 2018 Porsche Carrera Cup Asia. The New Zealander is twice a class winner of the event and will use his experience to help give the two Porsche factory crews the best chance of victory. On board the #911 Porsche 911 GT3 R is Mathieu Jaminet, who has been involved in several high-profile races since being made Porsche Young Professional in 2017, including an outing at the 2018 FIA GT World Cup in Macau with Porsche Motorsport Asia Pacific. The Frenchman is joined by compatriot Romain Dumas, who just missed out on the win here last year after a late red flag. 2016 Porsche Supercup champion Sven Müller is the final addition, as he prepares to debut at the Mount Panorama Circuit. In the sister #912 Porsche Matt Campbell returns, as the Australian aims to add an overall victory to his 2017 Bathurst 12 Hour Pro-Am win. Dirk Werner, who was team-mate to Dumas last year, joins the 23-year-old, with 2017 Porsche Supercup runner-up Dennis Olsen completing the line-up. Additionally, Team Carrera Cup Asia will make its second Bathurst 12 Hour appearance, fielding some of the best performers from the 2018 Porsche Carrera Cup Asia campaign in the #23 Porsche 911 GT3 Cup (Type 991). Spearheading the squad is Porsche Carrera Cup Asia’s only three-time champion Chris van der Drift, who was in a battle for the class lead before being forced to retire here last year. 2018 Pro-Am champion Bao Jinlong and event specialist Paul Tresidder, as well as top-performing Talent Pool driver from last year, Philip Hamprecht, join the New Zealander. The team will compete in the Porsche Cup Class B category, which always provides close racing around the tight and undulating 6.213 km circuit. The Bathurst 12 Hour will be streamed live on the Porsche Motorsport Asia Pacific website and Facebook page.